If you have decided to invest in a new energy-efficient fixed air conditioning or climate control system, and are in the process of having it installed, now is the time to think of servicing and routine maintenance. Most manufacturers, such as Fujitsu, Daikin, Mitsubishi Heavy Industries, Panasonic or Toshiba, require that a maintenance or service contract is in place in order to comply with their extended parts warranties. Service and maintenance agreements on air conditioning systems should be in place within 3 months of final commissioning of your new system following installation. Maintenance and servicing is especially important where the air conditioning is designed to keep your business-critical IT equipment, data centres or server rooms at the correct temperature, as IT equipment generates a lot of heat and can fail if it overheats. 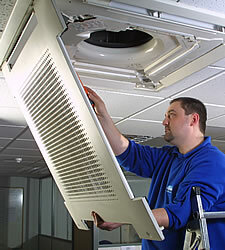 Our maintenance agreements include priority call out for added peace of mind. Normal adjustments and correction of faults to your air conditioning system will be carried out by our F-Gas registered engineer at the time of inspection. We will then provide you with a copy of our engineer's report and a quotation, should additional work be required, and we can supply emergency portable equipment if needed. If you already have a fixed air conditioning system, London Cool can provide a tailor-made air conditioning routine service plan or carry out a one-off service and maintenance visit. Some air conditioning units may require additional maintenance visits, for example, a kitchen or catering area will need the filters in their air conditioning equipment cleaned more regularly due to grease and debris. Do take a look at our blog for more information on the benefits of regular servicing and maintenance.